After a tough first Grand Prix weekend of the 2011 Formula One season, Team Lotus is pleased with both Jarno Trulli's and Heikki Kovalainen's performance. Trulli finished the race in 15th position, while his team mate was forced to retire the race due to a water leak. Heikki Kovalainen, Car 20 - qualified 19th, DNF: "Until the retirement I was very pleased with my own performance. I had a good start and was then staying with Alguersuari and Perez until the water leak brought my race to an end. I think this has been a bit of a tricky weekend for us, perhaps more difficult than we had anticipated, but we have some time now to analyse why the pace wasn't quite where we had expected it to be and to work on the reliability before we get to Malaysia. We're all ready to put in the hard work to make sure we keep moving forward, and these are still early days in the life of Team Lotus so we'll put in the hours and look for an improved performance in our home race in Malaysia." Jarno Trulli, Car 21 - qualified 20th, finished 15th: "It was really good to finish the race and to show that there is some pace in the car, despite some of the problems we have had to work through this weekend. We now have a lot of very useful data we can use to help us move ahead in Malaysia and China and I think once we have got through these early teething troubles we will show that we have taken the step forward we want to this year." Thierry Salvi, Renault Sport F1 Support Leader: "That is a good result for us. We were not able to finish the race with Heikki but with Jarno we saw some encouraging signs from the car's behaviour and I think we will be able to extract more performance from it in the next race after we have been through the data in more detail. 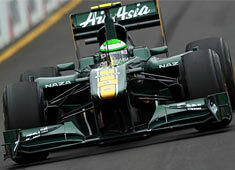 For the first race with a Renault Sport F1 engine in a Team Lotus car this is a good day." Mike Gascoyne, Chief Technical Officer: "After a pretty tough weekend I am very pleased with both Jarno and Heikki's race performances. We had an issue with water leak on the radiator on Heikki's car and soon after his pitstop that unfortunately brought an end to his race. He had been very strong on the options so that was a shame, but he had looked good until that point which is obviously encouraging. Jarno struggled early on with the prime tyres so we swapped him onto the options and he quickly found his pace. Our speed in the race was much more representative of the pace we had shown in testing so for Malaysia the target is to make sure we achieve that level throughout the whole weekend. In summary it was good to get one car to the end with solid pace and thank you to the whole team for some very good work all week." Tony Fernandes, Team Principal: "I am happy. After a tense day to see Jarno have a strong finish in 15th and show good speed in the race is very pleasing. We knew we had a potential issue with the radiator on Heikki's car so when he had to pull over it was not a surprise, but the main thing for me today is that the pace we showed in the pre-season tests is back. We were able to stay with the midfield teams and that has been the stated target for this year so now we know we have a base to build on for the season ahead and some time to fix the radiator issue before we go home to Malaysia for the next race. With the work ethic and spirit in our team I am confident we will take another step forward in Sepang and we are all very excited about coming home again for the next race."